← >What Could Have Been. >Is There Hope for Oliver Perez? A.) Launching the entire 40-man roster, the coaching staff, and 12 members of the front office into space on one of Richard Branson’s space planes. 8.4 million dollars more than Oliver Perez was worth in 2009. D.) Holding a “Back to the Future” night at Citi Field and giving 400 lucky fans their very own DeLorean. E.) Letting Angel Pagan dress up as the Joker and actually reenact that scene from “The Dark Knight”. F.) Saving it and signing Matt Holliday this year. This and “D” are the best options. Perez was a sunk cost in 2009 and is still under contract for two more years. Do the Mets have any hope of getting some kind of return from him? 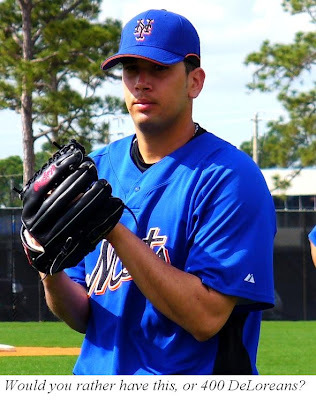 Well, while it’s unlikely he will ever be worth $12mil a season, it’s possible the Mets can still squeeze some lemonade out of the lemon that is Oliver Perez. Strikeouts require no luck and no work by the fielders, and infield flies require little of each –puts on Jay Leno chin – you know, unless you have Luis Castillo at second base. Am I wrong? Am I wrong? – wonders how career fell so far. Takes off chin. Ground balls and fly balls rely much more on the skill of fielders to turn into outs (see Pelfrey, Mike 2009), but whereas ground balls very rarely turn into anything worse than singles, fly balls have the unfortunate tendency to sometimes become home runs. Line drives obviously have the greatest likelihood of becoming hits, turning into outs only about a 25% rate. Which of these methods of getting outs, if any, does Ollie do well? Perez, even in 2009, can still racks up the K’s. His 2009 K/9 rate of 8.45 was comparable to Josh Beckett’s and A.J. Burnett’s rates. A lot was made about the drop in the velocity of his fastball (90.0 mph from a career average of 91.2 mph), but it apparently did not effect his ability to strike out batters; Ollie’s strikeout rate actually slightly improved from his rate in 2008. This is good news. The rest of this post will consist only of bad news. When hitters don’t swing and miss, they tend to hit the ball into the air against Oliver. If a pitcher is going to succeed with fly balls, they need to be able to limit home runs and create plenty of infield flies. Johan Santana did both well this year, thus he is good. Oliver Perez, who creates way more fly balls than Santana, – OP had the seventh highest fly ball percentage in the majors among pitchers who threw at least 60 innings- did neither well in 2009, thus he is bad. Oliver found success in 2004 and 2007 by keeping about 12% of his fly balls on the infield, but that rate dropped to 8% in 2009. His HR/9 also jumped, from 1.12 in 2007 and 1.11 in 2008, to 1.64 in 2009. Oliver saw his fly balls being hit farther and farther this year, both out of the infield and out of the park. This is indeed part of his failings, although if you thought to yourself at any point during the 2009 season, “You know what Oliver’s biggest problem is? Not enough infield flies”, you may be suffering from undiagnosed “Bengie Molina disease”, an incurable affliction that causes you to ignore the importance of walks. Now we arrive at Oliver Perez’s biggest, most obvious problem in 2009: the walks. So many walks. “Not walking people” should be filed under the “not allowing runs” part of tasks a pitcher must accomplish. Whereas even line drives turn into outs about 25% of the time, walks turn into outs 0% of the time. Putting people on base for free is not a good idea. Oliver walked 7.91 batters per nine innings, which actually ties him with Carlos Marmol atop the leaderboards, but the third place finisher in this walkathon only walked 6.60 per nine innings. I don’t have much to say about the walks other than “way too many.” This is the thing Oliver needs to improve the most if he wants to become a Major League pitcher again. The 2009 incarnation of Oliver Perez obviously had control problems, much worse than normal. He couldn’t find the strike zone most of the time, and whenever he did, people were able to hit the ball in the air and hit it far. That’s the bad news. I don’t know if these worse than normal control problems are attributable to his knee problem, pitching in the WBC, or just being more wacko. It could be any and all of those reasons. However, the good news is that Oliver still strikes people out. It’s the only thing he does well, but it is the most important thing for a pitcher to do well. The contract is a disaster no matter what; even good Ollie doesn’t pitch enough innings over the course of a season to justify the money, but it’s not all doom and gloom for Ollie. He strikes out enough batters where he can possibly once again become a useful pitcher in addition to just being an epically overpaid one.